Calcium (as Silicate) 66mg 7%. Magnesium (as Phosphate) 35mg 9%. Sodium (as Phosphate) 248mg 10%. Sodium Phosphate, Potassium Phosphate, Magnesium Phosphate, Amino Shield® (Eriobotrya japonica Extract 25% Pentacyclic Triterpenes). Malic Acid, Natural And Artificial Flavors, Citric Acid, Turmeric Oleoresin, Caramel Color, Sucralose, Acesulfame Potassium. Malic Acid, Natural And Artificial Flavors, Citric Acid, Red Beet Juice Powder (for color), Sucralose, Acesulfame Potassium. Sodium Phosphate, Magnesium Phosphate, Potassium Phosphate, Amino Shield® (Eriobotrya japonica Extract 25% Pentacyclic Triterpenes). Malic Acid, Citric Acid, Natural And Artificial Flavors, Sucralose, Natural Purple Carrot (Daucus carota) Extract (for Color), Acesulfame Potassium. Now with 10 grams of total amino acids including 5 grams of BCAAs, Aminolytes is the perfect blend of amino acids and electrolytes for helping people train harder then recover faster. Used during and after a workout, Aminolytes increases muscle endurance, accelerates muscle recovery and repair, and maximizes muscle growth. Formulated with the highest quality ingredients, Aminolytes helps all athletes—professional or amateur—get big, strong, fit, and healthy. With this formulation upgrade, Aminolytes is designed to bring that extra edge during training. Along with increasing the amino acid content to 10 grams, the ratio of the BCAAs leucine, isoleucine and valine were fine-tuned to a unique 5:1:4 ratio. The harder people train, the more they sweat out electrolytes that their bodies need. 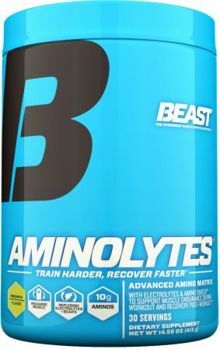 Aminolytes replenishes those electrolytes to maintain the balance of fluids in the body, quickly restore muscle endurance, and fight fatigue. To help hard-training athletes maximize amino acid intake even more, our formula upgrade contains AminoShield. This proprietary extract of the Eriobotrya japonica, or loquat plant, helps support lean mass by reducing catabolic protein breakdown. It has been shown to enhance endurance and protein accumulation. Pineapple This is a Buy 1 Get 1 FREE offer!